When the system neutral may not available, earthing transformer may be used to obtain the neutral. The neutral point of transformer to the earth ground network provides a reference point of zero volts. Total capacitive charging current (It). Neutral earthing transformer secondary current. Required grounding resistor value at primary side (Rp). Required resistance value at secondary side (Rsec). 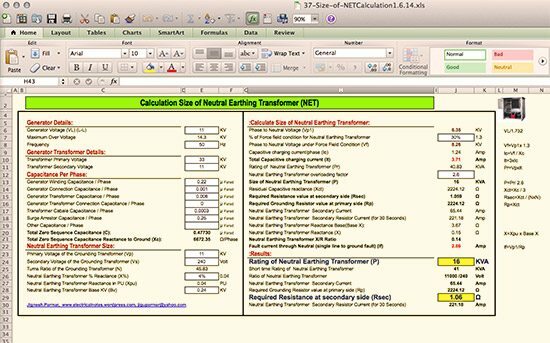 Rating of neutral earthing transformer (P). It might be interesting to read technical article about all types of neutral earthing in power distribution: Part 1 and Part 2. 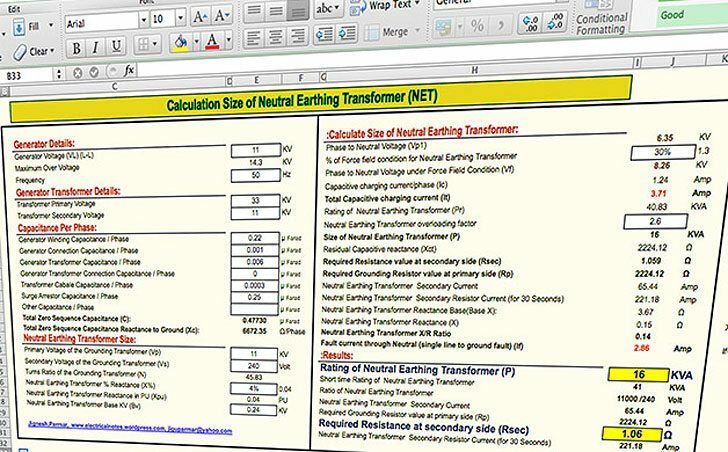 I have not yet used the spread sheet but is it able to calculate size of grounding wire of 3 phase transformers. Will be fixed very soon, please be patient… Tnx! I am unable to download the sheet. Sir, thanks for upload. How do you determine the transformer overloading factors? Can you kindly send the same to me at the following address.